Passengers are welcome to board our ship at 6:00PM. After comfortably settling into your cabins, we’ll introduce our crew at a welcome cocktail. Our ship will sail towards Mainz. Enjoy an evening of entertainment. Our ship will sail through the night. CLASSIC: Visit of Mainz and a visit to the Gutenberg Museum. In the afternoon, we’ll glide through the legendary and romantic Rhine Valley, listed as a UNESCO World Heritage Site since 2002. We’ll also pass the legendary Lorelei rock, named after a beautiful young maiden who, according to German legend, threw herself into the river in despair over a faithless lover and was transformed into a siren. We’ll arrive in Koblenz during the evening. During the evening, visit the city with our host or hostess. CLASSIC : Visit of Cochem Castle. Return on board and cruise towards Trier. Enjoy an evening of entertainment. Our ship will sail through the night. We’ll spend the morning cruising on the Moselle. Our ship will arrive in Trier by late morning. In the afternoon, join us on an excursion common for both Classic and Discovery excursions packages Visit of Trier and its Roman ruins. Tonight is our gala evening and dinner. Enjoy one last buffet breakfast on board before disembarking at 9:00 a.m. Coach transfer back to Strasbourg. End of our services. Passengers are welcome to board our ship at 6:00 p.m. After comfortably setting into your cabins, we’ll introduce our crew to you at a welcome cocktail. Evening of entertainment in the lounge. We’ll remain in port overnight. In the morning, excursion common for both Classic and Discovery excursions packages: visit of Trier and its Roman ruins. 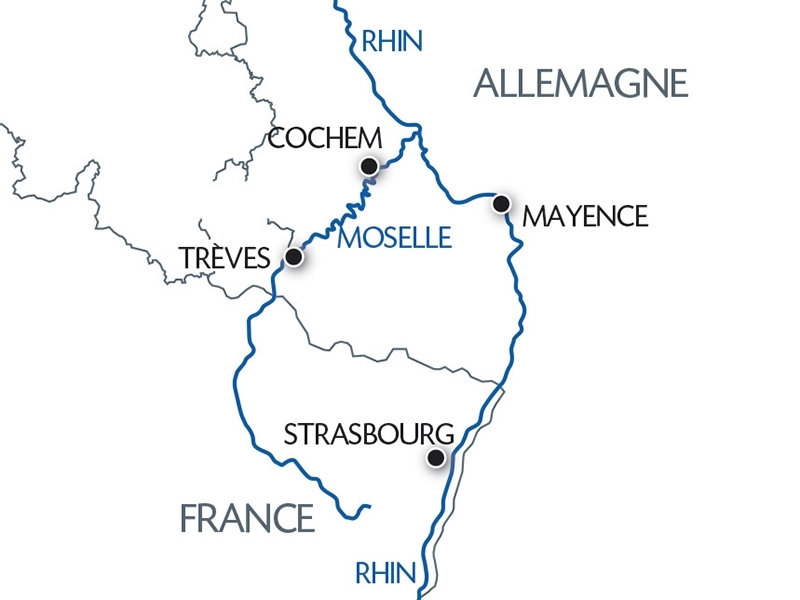 We’ll spend the afternoon cruising on the Moselle. Tonight’s entertainment will be provided by the crew. We’ll spend the afternoon cruising on the Moselle. The evening, visit the city of Koblenz with our host or hostess. We’ll remain in port overnight. In the morning, we’ll glide through the legendary and romantic Rhine Valley, listed as a UNESCO World Heritage Site since 2002. We’ll pass the legendary Lorelei rock, named after a beautiful young maiden who, according to German legend, threw herself into the river in despair over a faithless lover and was transformed into a siren. Return on board in Worms. Gala evening. During the night, we’ll cruise to Strasbourg. Disembark at 11:00 a.m. End of our service.